The pictures were shared by YouTuber Lilly Singh, who is seen happily applying haldi on Nick. Priyanka Chopra and Nick Jonas have been married for more than two months now, but never before seen pictures from the festivities that took place before and after the wedding are still emerging. The latest pictures to come out are from their haldi ceremony, and they were shared by YouTuber Lilly Singh, who looked like she was making sure every nook and cranny of Nick’s was covered in haldi. In the pictures, Lilly shared with the caption, “How to turn a Jonas brother into a Simpson. If I’m gonna do it, I’m gonna do it right! My sis @priyankachopra told me no mercy during the haldi (turmeric) ceremony on @nickjonas. 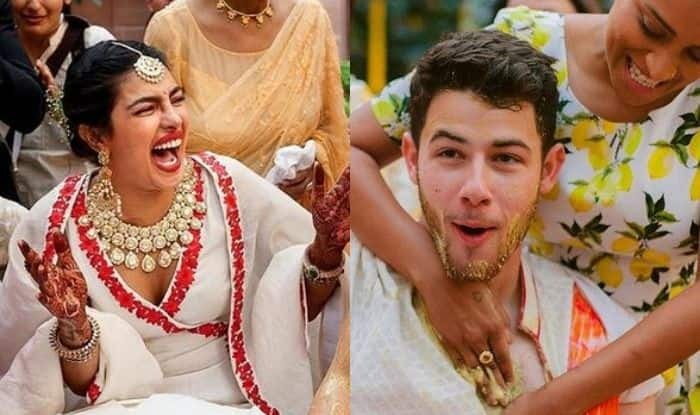 Ya girl had to deliver”, Nick could be seen sitting quietly as the haldi was being applied, while Priyanka, who was seated by his side, could be seen laughing uncontrollably. Priyanka and Nick had tied the knot on December 1, 2018 at Umaid Bhawan Palace in Jodhpur. Their marriage had been conducted according to both the Christian and Hindu rituals. The two then held receptions for their family and friends in Mumbai, Delhi and the US. Priyanka, who will next be seen in Hollywood movie Isn’t It Romantic alongside actors Rebel Wilson, Liam Hemsworth and Adam DeVine, recently spoke about her marriage on The Tonight Show Starring Jimmy Fallon. When asked why she decided to add Jonas to her name, she had said it was because they were becoming a family, and she was old school. Priyanka is also busy with shooting of The Sky Is Pink, a biographical film directed by Shonali Bose and which will also star Farhan Akhtar and Zaira Wasim. Nick on the other is set to reprise his Jumanji: Welcome to the Jungle role in a sequel of the fantasy action-adventure comedy film.